Thanks Coach Dave Hahn and Dan Hytinen! Coach Dave Hahn, throws coach at UW-Whitewater, shared his knowledge with Throws Club athletes. Also visiting and coaching was 2 time DIII National Discus Champion Dan Hytinen. Dan gave us a special treat by getting his final practice in before the US Championships this weekend . His quick final tune-up included a throw of 202'9"!!! Dan you are ready! Best of luck Friday. CHECK OUT VIDEO OF Dan at practice. Thanks everyone for being waterproof! Throwing in the rain is not ideal but a reality from time to time during the season. Practicing in the rain is essential to learning how to maintain good body positions throughout your throws. Yes, you must slow down, however maintaining balance over each phase of the throw is critical to throwing well on wet or fast circles. I had a great opportunity to talk with Mac Wilkens, former Olympic Champion and U.S. record holder in the discus, about how he approached throwing in the rain and he had some interesting points of view. His advice was to "SLOW DOWN!" "If you are 150' discus thrower - slow down and hit good positions. Try to start with a comfortable warm-up throw of 120'." Then add speed as you feel comfortable. 'Slipping, falling down, or throwing out of bounds going full speed doesn't tell you anything you didn't already know. Build up your speed and aggressiveness slowly and you will be more confident in a wet circle.' Great wisdom from a great thrower. Weather, especially in the discus, be it rain or wind, can really have a huge impact on distance. Some days the weather might dictate if you can throw for a P.R. or if you must just focus on competing in the elements given. If you can remember this when you train in the rain you could be preparing yourself for an important meet that may have terrible weather in the future. If you know its going to rain a couple days out from a big meet...try dumping a bucket of water in your circle at practice and throw in conditions similar to the real thing. Shoot some video of your wet circle throws and see if you are maintaining good positions. If you lower your center of gravity by bending your knees a bit more than usual you might see that you can maintain better control. If you see you are slipping and falling all over the place - check the video: is your upperbody doing more work than your lower body? Or you might be falling because you are not keeping your center of gravity over your knees and feet. Practice throwing in less than ideal weather and you may surprise yourself at the confidence you can build-up. You may even catch your opponents off guard. Jacob Ninneman, Senior - Oregon, won the DIVISION 1 BOYS DISCUS with a personal best and school record of 180' 0". The 19' P.R. forced the rest of the field to chase him and they couldn't catch up. Congratulations on your huge throw! Kailee Kamps, Sophomore - Belmont, won the DIVISION 3 GIRLS DISCUS with a throw of 132'7". A great throw and performance after shot put a day earlier did not go as well as Kailee planned. To come back and win the discus the next day is an incredible accomplishment, congrats! 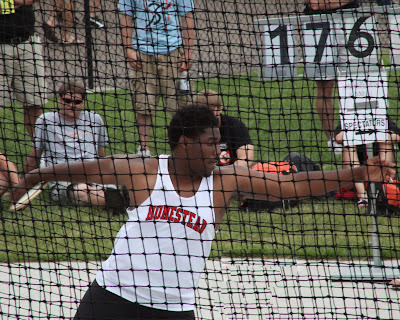 Angela Boushea, Senior - Monona Grove, 2nd D1 Girls Discus - 148'8"
Angela Boushea, Senior - Monona Grove, 2nd D1 Girls Shot Put - 47'4.25"
Raffi Saez, Junior - Oak Creek, 2nd D1 Boys Shot Put - 58'11"
Justin Barber, Senior - Homestead, 2nd D1 Boys Discus - 176' 8"
Molly Griep, Sophomore - Whitewater, 2nd D2 Girls Shot Put - 41'11.25"
2. Raffi Saez - Junior - Oak Creek - 58'11"
3. Justin Barber - Senior - Homestead - 58'7.75"
4. Theron Baumann - Sophomore - Monona Grove - 57'2"
9. Drex Jackson - Junior - Verona - 55' 0.5"
1. Jacob Ninneman - Senior - Oregon, 180' 0"
2. Justin Barber - Senior - Homestead - 176' 8"
8. Raffi Saez - Junior - Oak Creek - 163' 10"
9. Theron Baumann - Sophomore - Monona Grove - 163' 6"
10. Drex Jackson - Junior - Verona - 161'7"
2. Angela Boushea - Senior - Monona Grove - 47'4.25"
20. Emily Franz - Senior - Madison Memorial - 35' 2"
2. Angela Boushea - Senior - Monona Grove - 148'8"
6. Emily Franz - Senior - Madison Memorial - 120' 9"
2. Molly Griep, Sophomore - Whitewater - 41'11.25"
5. Molly Griep, Sophomore - Whitewater - 126' 0"
9. Heather Clankie - Brodhead - 122'1"
13. Stephanie Tweed - Marshall - 109'4"
4. Kailee Kamps - Sophomore - Belmont - 37'8.5"
1. Kailee Kamps - Sophomore - Belmont - 132'7"
Congratulations Athletes, Parents, and Throws Coaches!! WHEN IT COMES TO THE STATE MEET : MTC GIRLS MORE THAN JUST WANNA HAVE FUN!